It’s necessary to visit São Francisco River to understand why so many writers revered it. During this enchanting contact, which can be made in various cities of Bahia, it’s possible to have a little of the inspiration that has already swept many composers. In this area of Bahia, several cities offer visits to a variety of leisure options, from the famous bungee-jump from the top of bridges and several extreme sports, to get-togethers in bars and restaurants to contemplate the sunset. It’s worth reminding the visitor that any activity chosen will be special because in the “Old Chico’s” (as the rivers is called by locals) company, everything is unforgettable. Paulo Afonso is one cities of the region that stands out. It rises, in the tourism scenery, as one of the entrance gates of the Lake Region and has as the main attraction, ecotourism and adventure tourism. 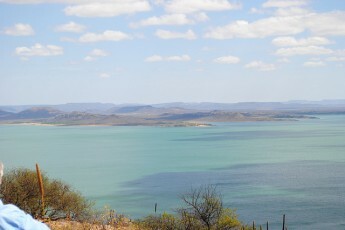 There, the visitor can practice extreme sports, o explore trails in the caatinga and visit São Francisco River’s canyon, poles of fish culture and the facilities of São Francisco Hydro-electric Company (CHESF). The biggest artificial lake of the world is located in Paulo Afonso, the famous Sobradinho, which has also been sung in many songs. It has an area of 4 thousand square meters and storage capacity for 34 billion cubic meters of water from São Francisco River. It’s the stage of sports modalities and amateur and professional fishing. Juazeiro da Bahia, main bordering point between the states of Bahia and Pernambuco, maintains a prosperous commerce by the margins of São Francisco Ricer and a modern agro-industrial pole, with intense exporting activity. The city still keeps some monuments of civil architecture of the last century and was modernized with the urbanization of the fluvial shore and the reconstruction of the arches of the Eurico Gaspar Dutra Bridge, now occupied by small bars and restaurants.